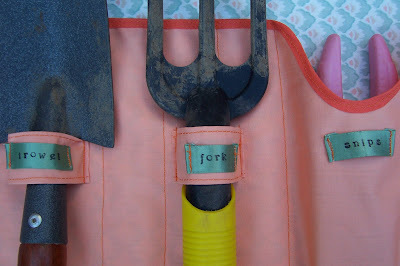 house of spoon: get out in the garden! Well in these days of sun-shine and giant-weed-growing it is definitely a pleasure to be out and about in the garden. My garden isn't big and yet i never seem to have my tools nearby...usually i am balanced with one foot on a rock and the other against the fence...reaching for an errant branch to tie it down, when i see another little twig sticking out of the trunk which was certainly not invited to grow in such an uneven, straggly way and is crying out to be snipped....and when i glance round looking for my magic pink snips....they are usually sitting miles away on the pic-nic table....groan! But no more!!! 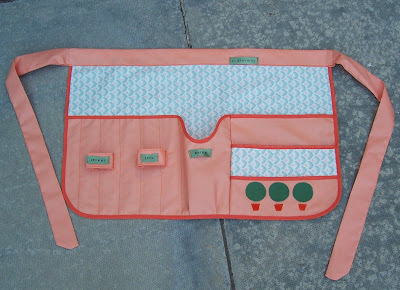 Welcome garden-apron!!! Everything organised and in its special labelled place...and all is right with the world! 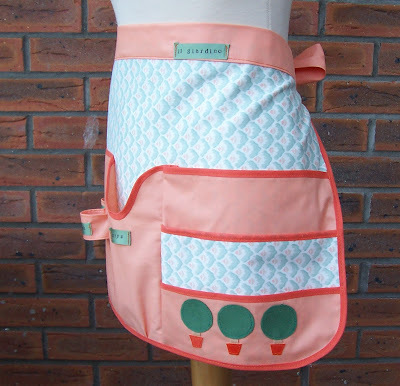 It actually hurt a little bit, putting the dirty tools into my lovely clean apron!! lol Haha...these little plastic tie thing-ies are never around when i need them!! Go garden apron!! 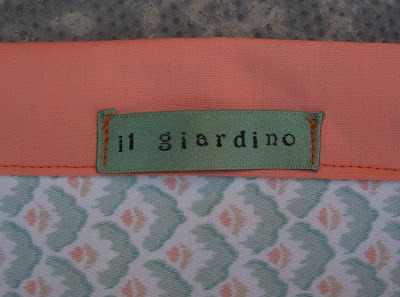 This little "il giardino" label is not just there to cover a bit of the seam where my little sewing machine friend "hiccup-ed" and ruined the nice straight line...o no, it is also super-useful to thread my ipod earphone cord through so it doesn't keep falling into the plant pots im trying to fill. The letters were stamped in fabric ink and then heat sealed with the iron for permanence. I made it quite wide so that the heavier trowel sits at the side of the hip, and therefore doesn't hit my leg when im trying to walk!!! Weeds and scruffy branches beware! I swear you're going to give Martha Stewart a run for her money! 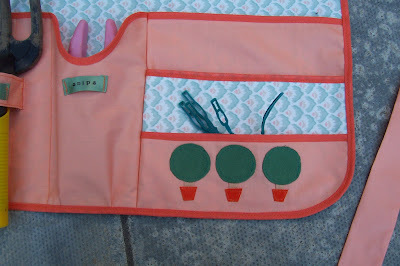 That is soo cute and brilliantly useful. Love the colours and name tabs! Good job your fork doesn't have sharp points!!! 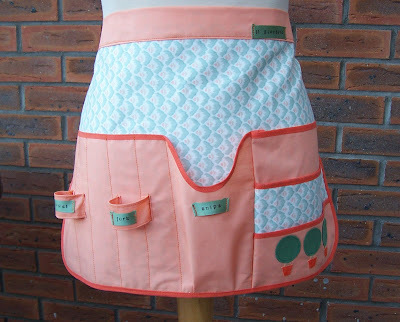 "Ingenious"
Very nice apron!! 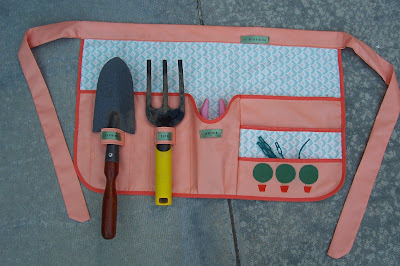 A very good idea to work in the garden.